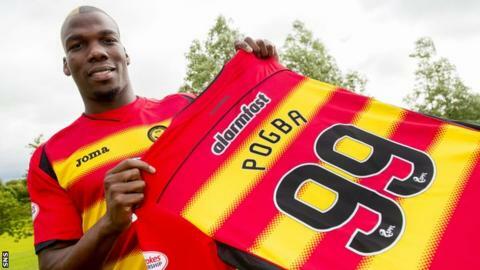 Rodney Sneijder and Mathias Pogba are the latest members of football families to arrive in Scottish football. Both of their careers have been overshadowed by more famous siblings, in the Dutch international Wesley Sneijder and the French international Paul Pogba, but they are also connected by another similarity: both are part of a family of three football brothers. Jeffrey Sneijder started out at Ajax like his two younger brothers, only for his career to be hampered by injuries, while Florentin Pogba is Mathias Pogba's twin brother and currently plays as a central defender for St Etienne. Pairs of football-playing brothers litter the game's history, but what about three or more brothers who have been involved in Scottish football? Members of a famous Celtic family, the three McStay brothers followed in the footsteps of their great uncles Jimmy and Willie McStay, who both captained Celtic. Paul McStay, a gifted, elegant midfielder, was the middle brother - between Willie and Raymond - and had the most significant career, playing 515 games for the club, becoming captain, and winning three league titles, four Scottish Cups and the Scottish League Cup. Willie made 67 appearances for Celtic, before a career that took in a spell in England and time at Kilmarnock and Sligo Rovers, while Raymond only made the bench before leaving for Hamilton Accies. Injury eventually forced him to retire. Another family with high-level connections at Celtic. The three McGinn brothers - Stephen, Paul and John - are the grandsons of former Celtic chairman and former SFA president Jack McGinn. Stephen, a 26-year-old midfielder, currently plays for Wycombe Wanderers, having initially broken through at St Mirren. Paul also had a spell at St Mirren, but didn't play a first-team game, and is now a full-back for Dundee, while John, another midfielder, also came through the youth ranks at the Paisley club and has just signed as a free agent for Hibernian. Billy King, the Hearts attacker, is at 21 the eldest of four footballing brothers. Adam left Tynecastle for Swansea last year and the 19-year-old midfielder has now joined Crewe Alexandria on loan. Ross is the third brother and has spent time on trial at Rangers having advanced through the youth ranks, while the youngest of the brothers, Robbie, is in the youth set-up at Hearts. Keaghan Jacobs and his triplet brothers, Devon, Kyle and Sheldon, all played for Livingston against Albion Rovers in April 2010, the first time that four brothers had featured in a senior match. The four, who are originally from South Africa, joined the Rangers youth set-up before all moving to Livingston. Keaghan, a 25-year-old midfielder, now plays for Bidvest Wits in Johannesburg, while Kyle, 24, is a midfielder with Queen of the South. Devon joined junior side Kelty Hearts this summer after leaving Berwick Rangers and Sheldon left Livingston to pursue a degree at Stirling University.